This week people all over the world will begin cleaning their houses, exchanging gifts, eating sweets and lighting candles. Why? Because they're celebrating Diwali. Hindus, Jains, Sikhs and some Buddhists from India to Chicago will observe this festival of lights. In Hindu tradition, Diwali is the celebration of the triumph of good over evil from the epic Ramayana. The Ramayana is the tale of a brave prince, Rama, and his beautiful bride, Sita, who are separated by the demon king, Ravana. 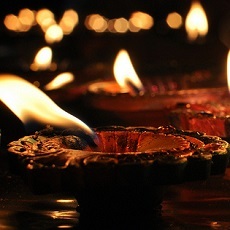 Diwali celebrates Ravana's defeat and Rama and Sita's return to their kingdom. You can read more about it in the Prince of Fire and The Story of Divaali. Do you celebrate Diwali by eating mango-coated donuts or going to a parade? In Diwali, you can read about the modern Hindu celebration of Diwali around the world, while Here Comes Diwali will give more historical recipe ideas. If you're Jain, you're wondering why we've only talked about Ram and Sita because you're celebrating the birth of Krishna! In Celebrate Diwali you can see beautiful pictures of how Hindus, Jains and other religious groups celebrate Diwali. It is traditional to eat sweet things to celebrate this sweet holiday. Families may like to try making some of the yummy desserts from Made in India or The Cardamom Trail—just remember to share them with your friends and neighbors!